“You have a parcel from France!” I heard CT shout. Rushing from the kitchen, I was excited to see it was a box of French chocolates, no less – ooh la la! This was the November offering from Club Chocolat Francais and I couldn’t wait to get my snout into it. I reviewed a similar box of these French Chocolates by Post a few months ago and you can find out more about the company behind the chocolates there. It looks as though they’ve listened to feedback as the flavours are rather more exciting than the last box I reviewed. As before, a gorgeous aroma of chocolate and nuts wafted up from the box when I opened it, making the thought of having to take photographs before diving in, almost unbearable. Don’t look too closely at the picture or you might notice that the salted caramel got the better of me before the camera was out of its case. Again, there was a good mix of dark, milk and white chocolates. Although pralines prevailed (and that was all right by me), they were all quite different and there were a number of other interesting choices. Dark chocolate salted caramel – the dark chocolate had a particularly rich aroma and it’s strong flavour together with the salt offset the sweetness of the caramel very nicely. Lemon & coriander – this was particularly flavoursome, very lightly lemony ganache enrobed with dark chocolate and with a lovely aftertaste of coriander. Pistachio praline – the pistachios really came to the fore in this milk chocolate and was probably one of the nicest pralines I’ve ever eaten. Praline petal – unusual in appearance and delicious in taste, this consisted of a thin layer of praline enrobed with lots of milk chocolate. Caramelised praline – caramelised nuts really made this praline stand out. Other mixes, I wasn’t so sure about. I felt that in the case of passionfruit and coconut, the coconut overwhelmed the passionfruit. Conversely, the raspberry and pistachio was the other way around and the fruit overwhelmed the nut. However, all in all, I really enjoyed these and would be delighted to receive a box of 34 French chocolates in the post every month. If this appeals to you, then do take a look at the Club Chocolat Francais website, where you can sign up straightaway if you so desire. I am delighted to say I have been offered three boxes of these delicious French chocolates to give away. To be in with a chance of winning, please fill in the Rafflecopter below. You will need to leave a comment on this post which then gives you additional chances to enter if you so wish. Rafflecopter will pick three winners at random from the entries received. If you are commenting anonymously, please give me some way of identifying you as I will be verifying the validity of entries. Any automated entries will be disqualified. This giveaway is only open to those with a UK postal address. Because of the Christmas rush, winners will need to respond within 3 days of being contacted. Failure to do this will result in another winner being picked. Prizes are offered and provided by Club Chocolat Francais and Chocolate Log Blog accepts no responsibility for the acts or defaults of said third party. i loved the hazelnut liqueurs they sold when i went to the dordogne. They all sound very tasty; I’d love to try the lemon and coriander. They look and sound delcious. Love the idea of the pistachip praline. Yum! I cannot decide if a chocolate flavoured with Absinthe would be one to taste or to avoid. It would certainly have a powerful after taste. Truffles are always good – and are nice and decadent. A dark Calvados truffle would go down very well with me! Some kind of calvados or French cider ganache in a chocolate would be delicious! I was first of all tempted to say truffle but that is a bit Heston Blumenthal so I’ll go for calvados as champagne is so gorgeous in chocolate. Perry (as in the alcoholic drink) in dark chocolate! French Iingredient? How about some good old French cheese, maybe Brie not Roquefort! A French red wine chocolate?! I’d like to try a ‘creme anglaise’ chocolate. Num num num! marzipan and walnut – that would be a definite favourite in this house! Pink champagne with pink iced chocolate would be lovely. Some nice Champagne truffles would be nice. I love Champagne ones, So I’d say this. I’d absolutely love to win a box of these – I especially love the sound of the pistachio praline, something I’ve been meaning to try to make but never got round to! A nice champagne! Yum yum. Chartreuse (a French liqueur) mmmm it is lovely! Chocolate and champagne, a marriage made in heaven! a nice full bodied Bordeaux red used to candy chunks of Morbier (cheese)- like a red wine cheese cake, floating in Crème de cassis then wrapped in a thick dark shell. I think Crème de cassis with a candied black current would also be tasty. I’d like the taste of apricots within a chocolate as I loved the Clafoutis aux Abricots I once tried. Champagne with srawberry – yummy! 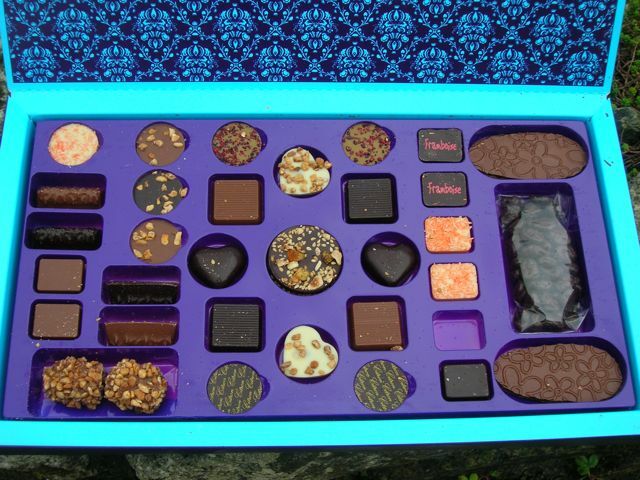 If I win the box – it goes to the Oxford Chocolate Enthusiasts’ Club! Oh my gosh, they look soooo good! Would have to be Champagne, don`t fancy Frogs Legs! Some grand marnier would be nice, I love chocolate orange flavours. I think Domaine de Canton (a ginger-flavored liqueur) would be fabulous! Thanks! Any french cheese, cheese and chocolate are lovely. I bought a cream calvados years ago which would be lovely in a choc. Ooh! lovely chocolates what a fab giveaway. Would love to try the salted caramel! Herbs de Provence…just a tiny flavouring! Creme De Mures would probably be amazing! A very interesting collection of flavours. Would love to try some of these. Got to be champagne please! mmmm maybe some french cider, or a combination with camembert as apples always go well with cheese! French ingredient I’d like to see used in chocolate? Marron Glacés, definitely! Cognac! I love rich chocolates with alcohol! I’m not sure if it would be the nicest, but I am really intrigued by the lemon and coriander and would love to try that. Champagne would be a great touch in a french chocolate creation. If its got lemon in it im your girl. How yummy do these look. pista praline could be a winner. Camebeart! Think it would be quite unique! It has to be champagne – non?!?! onion and garlic would be fun! Mmm, Champagne with raspberries and dark chocolate would be delicious! Would love to try Cannelle and Vanille – Cinnamon and Vanilla. Yum! Has to be champagne – magnifique! I think Mille Feuille incorporated into choclate somehow would be delicious. Confiture de Lait would be a nice ingredient – lovely and sweet! Would have to say champagne as its the only alcohol I like in chocolates and France is world-famous for its champagne. Calvados in either a truffle or a ganache would be delicious. Garlic was the first thing that came to mind but I’m not sure how that would work in chocolate! Would be interesting to try! A variety of french cheeses would add an interesting twist ! For some real decadent chocolate, french truffles could make a really interesting ingredient. Chapagne – got to be!